I’m catching a cold. Well, no wonder, after two consecutive night-train rides (read: almost sleepless nights) during this chilly weather. The second ride was specially awful, it felt like the heater in the train was broken, left me shivering the whole night. Why was i taking the night-train? Because of it’s cheapest fare :p. And why Rome? Hmmm, it’s a long story, I will dedicate another post for that. Back to flu… at my home, there’s this tradition to cook a comforting soup called hutspot every time someone gets sick. It’s originated from the Netherlands, and my grandmother started this tradition *she might pick some recipes around the time when Dutch colonized Indonesia*. Originally, it’s just potatoes, carrots and onions (plus some meat) boiled and mashed together. But then the recipe is modified. Mom’s way of cooking: instead of mashing them, the potatoes and carrots are cut into tiny pieces before boiled together; there’s a bit more water, not as dry as in above picture; and pieces of brisket (sandung lamur) are added, making the soup super delicious *I don’t know the scientific reason behind the selection of this beef cut :p*. Sometimes we lose our appetite when we’re sick, rite? But I will never ever say no to hutspot ^^. Unfortunately, there’s no Mom here now 🙁 and the preparation is a hassle, it needs extra efforts for cutting stuff. Besides, there is only one perfect hutspot that can heal this flu: Mom’s :p.
Flu and soups. They are a perfect match. Luckily I now know some recipes of quick soups *introduced by the bear, with a cheatsheet from Mama bear :p*. By quick I mean without having to cut much. I cooked this for dinner today ^^. I bought quite some zucchinis because I planned to use them while cooking sayur asem for the last Indonesian lunch party here *no labu siam? let’s try zucchini ^^*. It turns out that they can be used to make a very nice soup. For the recipe I used the combination of this and the bear’s, as he said, “My Mom can make a very good zucchini soup!” ^^. First, the zucchinis are grated, a much easier preparation than cutting them :p, plus, there’s no need to peel the skin. Then I heated some onions in butter, and put the shredded zucchinis. I added some tomato pieces as per bear’s instructions, who also said to put in some dills *too bad I don’t have those*. Then, water is added, along with a stock cube, a bit pepper and salt; and let them boiled for a while. Lastly, I put some milk to make it a bit creamy. According to both recipes, it is usually served with plain yogurt or sour cream on top of the soup. And bread. Yumm.. I didn’t know before that it is possible to make a soup with cauliflower as the main ‘star’ ^^. As long as I remember, cauliflower is usually the supporting ingredient of a chicken soup, or cap cay. 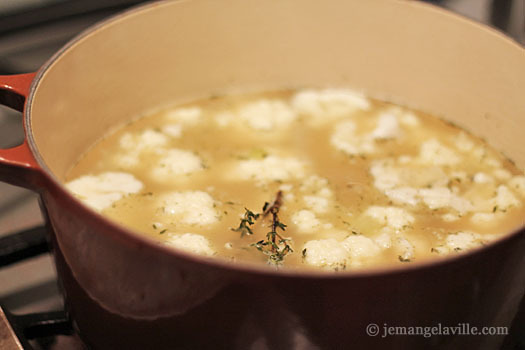 Making this cauliflower soup is also very easy, chopping a cauliflower doesn’t need a precise technique, as long as the flower is separated into smaller pieces. They’re then boiled, along with a stock cube; maybe a bit salt, but I like it without, since cauliflower is tasty enough. After a while, when the cauliflower pieces have become softer, the last step is to put in an egg. I have a special technique for this: after the egg is cracked into the soup, I carefully stir the egg white so that it’s dispersed while trying my best to keep the yolk intact, then I’ll quickly take the pot out of the stove before the yolk is fully cooked, the way I like it :p. I usually eat this soup with… rice ^^. Yep, that’s all ^^. Cooking these soups is as easy as cooking pasta or instant noodles, but much healthier. Ah, there’s one more easy vegetable dish, well, not a soup, but it’s my favorite veg-snack: Microwave Broccoli :D. I will stick to these easy soups while waiting for the time to go back home and dig into a bowl of more complicated and sophisticated Mom’s soups… hutspot, corn soup, asparagus soup, sayur lodeh, wait for me! Anyway, my most favourite food at home when I catch a cold is also hutspot! ^^ But it’s not easy to find hutspot in Seoul, so I replace it with dumpling soup (만두국) -___-‘ haha..